Freedom House, one of the top human rights organizations in the world, has a program helping journalists in Mexico. Below is an introduction and link to a story about that program. One of the most dangerous countries in the world for journalists is Mexico, where 11 reporters have been murdered since 2014. Mariclaire Acosta directs Freedom House’s program in Mexico City to improve journalists’ professionalism and safety. Acosta, Mexico’s former Deputy Secretary for Human Rights and Democracy, talks here about the interconnected crises of security, press freedom, and accountability. The following item was initially posted at the SPJ International Community site, Journalism and the World. Roy Greenslade at The guardian published an open letter from the director general of Swedish Radio, Cilla Benkö, calling for the safety of journalists to be taken more seriously by the international community. He put the whole letter in his latest March 11 column. A portion of that letter is posted below. To see the whole letter and Greenslade’s column, click here. Enough is enough. Every policy initiative that can be taken to secure the safety of journalists, both here in Sweden and internationally, through bodies such as the UN and the EU, must now be implemented. This is an urgent matter if we want to protect the freedom of the press and the freedom of expression.On Wednesday (9 March), our correspondent, Maria Persson Löfgren, was attacked while on assignment in the Russian state of Ingushetia. On 11 March 2014, our Asia correspondent, Nils Horner, was murdered in Kabul. Two completely unacceptable events. Both Maria and Nils were engaged in normal assignments for a foreign correspondent. The job is demanding, tough and sometimes associated with danger. We should be thankful that there are people who want to engage in this kind of journalism, because it’s through them that the rest of us learn about a reality that is often more complicated than those governing in a country would suggest. The issue of the safety of journalists must be taken more seriously at an international level. Ceasing to cover troubled areas is not an option. In an increasingly digitised world, it is very easy for extremist groups and others to spread their propaganda. For rest of letter click here. The latest victim in attacks against journalists in Mexico is Anabel Flores Salazar, a reporter in Veracruz. Mexican authorities say they are searching for her after reports she was dragged from her home by armed men and hasn’t been seen since. Salazar was taken Monday morning from her home near the city of Orizaba, where she worked for several newspapers. Unfortunately, kidnapping and killing journalists is not uncommon in Mexico. Since 2010 15 journalists have been killed in Veracruz alone. According to the Committee to Protect Journalists, 24 journalists have been killed in Mexico because of their jobs since 2010. A vast majority — 77 percent — of the reporters killed covered the crime beat, just like Salazar. Threats against journalists come not only from the gangs but also corrupt public officials. The BBC reports there are strained relations between the Veracruz governor and the media. The governor has gone as far as warning journalists to “behave” or bad things might happen to them. Understandably journalists in the area saw the comment as a veiled threat. Veracruz prosecutors say they will investigate everything about Salazar to see why she was kidnapped. The office said a few years ago she was seen with a leader of the local branch of the Zetas drug cartel. For reporters to do their job, they have to develop sources across the board. If a cartel leader doesn’t like a story, threats are made and carried out against journalists. Likewise, if a local political figure is identified as being in the hip pocket of a cartel, the journalist receives threats from or is intimidated by the local government. And then, there are a few bad apples in the journalism profession. Some have used their position as reporter or commentator to extort money from people in exchange for their silence on the air or in print. And because of the few unethical journalists, it becomes easier for governments and gangs to frame honest journalists, because the public is already to accept corruption within the media exists, just as it exists in the rest of society. And to be clear, the situation described above is not unique to Mexico. Journalists throughout the Western Hemisphere face similar threats from gangs and rogue government officials. This item was originally posted at Journalism and the World, the site of the International Journalism Community of the Society of Professional Journalists. For anyone who has paid attention to what is going on in Mexico, this is not news, but confirmation that the war against the cartels is not going so well in Mexico. The Mexican media was just getting out from under the thumb of the oddly named Institutional Revolutionary Party (PRI) that ran Mexico for most of its 100+ years. A breakdown in the control PRI had meant journalists could start actually being journalists instead of stenographers for the government. Then the cartels started gaining strength — with the help of corrupt national and local officials. Suddenly the threats to free and independent journalism was no longer the loss of a job, but death. In Mexico, as in El Salvador, Guatemala and Honduras, the issue is not government censorship but death threats from criminal cartels. The inability of the governments to address the issue speaks volumes about the corruption and weak legal systems in these countries. To be clear though, it does not mean the governments have a policy of media repression. Too many observers of Latin America see any attacks on journalists — or civic society activists — as being ordered by the local or national government. Unfortunately the threats are essentially from the “private sector” — the cartels. The law enforcement systems in these countries are so weak that the threats against journalists — and civic society activists — either are not investigated or such a weak case is built against the murderers that they go free. We are all aware that in too many countries journalists are killed for doing journalism. Over and over the phrase “violence against journalists is the ultimate act of censorship.” And yet, so few Americans think this can happen in the States. ProPublica notes how after the murder of Arizona reporter Don Bolles 1976, a group of 40 or so reporters from around the country continued his reporting on organized crime. The idea was to make a clear statement that freedom of press/expression must be defended. The reporting lead to the conviction of Bolles murder. The ProPublica report notes the killings of Vietnamese-American journalists in Texas, California and Virginia, arsons stretching from Montreal to Orange County, Calif. and death threats to individuals, families and businesses across the country have yet to be solved. After 30 years the FBI still has not arrested anyone for the violence or terrorism, much less charged and convicted them. The FBI quietly closed its inquiry in the late 1990s, making it one of the most significant unsolved domestic terror cases in the country. Forces operate to intimidate journalists around the world. There is no reason to believe the United States is immune from such actions. Journalists who are part of immigrant communities and who cover those communities especially face dangers US-born journalists may not comprehend. Reporters cannot only be threatened while in the States, but their families in their home country can be threatened. These types of threats are typical of gang operations. Organized crime operations such as MS-13 and the 18th Street Gang have been known to use these tactics against Salvadorans and Hondurans in the United States. These are stories that are not often told in the United States. Part of the lack of reporting comes from reduced news staffs. But also, part comes from not paying attention to the local immigrant communities. If local news organizations were more aggressive in reporting about the dynamics within the local immigrant communities, they might see more than quaint festivals from other countries. And along the way, the readers/viewers/listeners to those news organizations would learn more about conditions in other countries and the daily connections to local issues. This blog was first posted at the SPJ International Journalism Community site. Joel Simon from the Committee to Protect Journalists has a featured piece in Columbia Journalism Review on how the United Nations should — but really can’t — do something about press freedom. What can the UN do for press freedom? Bottom line: Not much, but it can make some nice statements. Responding to an upsurge in media killings, particularly of journalists working in conflict zones, the UN has prioritized the issue of journalists’ safety in recent years. In 2012, UNESCO, the UN agency charged with defending press freedom, launched a Plan of Action on the Safety of Journalists and the Issue of Impunity. The following year, the General Assembly passed a resolution to create an International Day to End Impunity for crimes against journalists, marked each year on November 2. In July 2013, Kathleen Carroll, executive editor of the Associated Press, become the first ever journalist to address the Security Council. She noted, “Most journalists who die today are not caught in some wartime crossfire, they are murdered just because of what they do. And those murders are rarely ever solved; the killers rarely ever punished.” Last May, the Security Council passed a historic resolution reaffirming the international legal protections for journalists covering armed conflict. Secretary General Ban Ki-moon regularly condemns the killing of journalists, and calls on member states to take action. All of these measures are important, and have tremendous symbolic value. But it is difficult to point to concrete advances in response to UN action. In fact, the level of violence against journalists has increased in recent years, and imprisonment of journalists around the world has reached record levels. Recent high-profile cases—including the conviction of three Al Jazeera reporters in Egypt; the ongoing imprisonment of Washington Post reporter Jason Rezaian in Iran; and the seven-and-a-half-year sentence handed down to renowned investigative reporter Khadija Ismayilova in Azerbaijan—demonstrate that when it comes to imprisoning journalists, repressive governments are increasingly unresponsive to international pressure. Simon argues journalists, diplomats and other human rights defenders need to use the occasion of the annual opening of the UN General Assembly, when leaders from around the world come to New York to argue for more action to protect journalists in their home countries. Over the years, the Committee to Protect Journalists, which I head, has used the General Assembly to secure commitments from a number of heads of state, including former President Vicente Fox of Mexico, who agreed to appoint a special prosecutor for crimes against journalists, and President Recep Tayyip Erdogan of Turkey, who committed during a meeting at the Council on Foreign Relations to receive a CPJ delegation in Ankara. Simon says this one-on-one approach should not let the United Nations, itself, off the hook, but it appears to the only way — for now — to get things done. He argues journalists should demand accountability from the leaders who speak a the UNGA for their violations of press freedom. By just reporting the speeches and not looking at the records of the speakers, journalists become accomplices in efforts to whitewash media repression. This item was initially posted at the SPJ International Community site: Journalism and the World. Once again proof that all it takes is some encouragement and a few — VERY FEW — bucks to put together a major effort to expose violations of human rights, including freedom of speech and press. 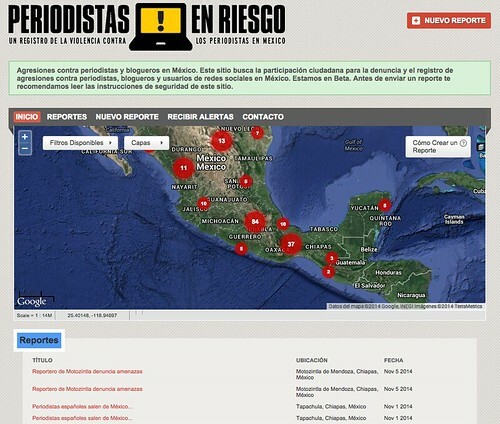 The Mexican map — Perriodistas en Riesgo — was created in 2012 and focuses on where journalists are under threat. Attacks are divided into four categories: physical, psychological, digital and legal. Each category can then be modified by multiple subcategories. For example, a physical attack could be a kidnapping, beating, disappearance, murder, etc, and one attack, such as a reporter being mugged and having his cellphone and laptop stolen, could be categorized as a physical and a digital attack. 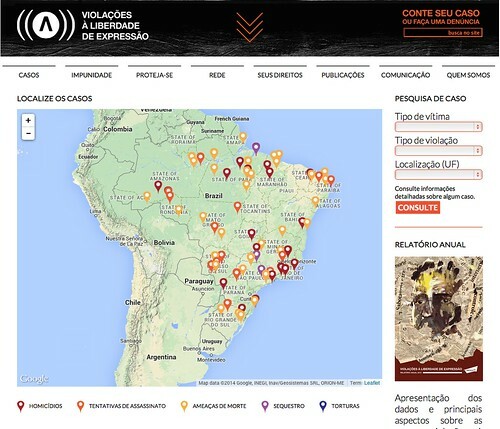 The Brazilian map — Violacoes a Liberdade de Expressao — casts a much wider net. It only started in November 2014 but does look at all forms of violations of freedom of expressions, including attacks on journalists and legal proceedings designed to silence human rights advocates. The items on the Brazilian site are confirmed by Article 19 before being posted to the site.